There’s a period of anticipation at the start of any journey when you’re researching your intended destination to find the right spots to stay, places to eat and things to do. For organizations migrating to the cloud, that phase is known in the industry as experimentation. The experimentation phase is important because cloud computing is an unknown for many businesses. As I explained in my last post, developing an enterprise cloud strategy isn’t simply about finding a more affordable way to manage IT. It’s about finding ways to get more out of many facets of your business. Experimentation is useful in helping choose where to get started on the road to the cloud, and envisioning your ultimate destination. When Microsoft was moving to the cloud, we did a little “tire-kicking” of our own. We picked a project that was non-essential to the company — a cloud-based version of an app that we built every year for our month-long auction to raise money for charities. It was a great opportunity to see the scalability of the application over time as the end of the auction drew near and usage of the app increased. Concurrent with engineers experimenting with how to build, test and deploy apps in the cloud, business and IT departments need to envision how they can help their company leap ahead through services or applications that are broader in scope, that create agility, and that take advantage of cloud services such as machine learning, big data and streaming analytics. This exercise helps to crystallize where moving to the cloud could take the company. It can also help mentally prepare for the next phase: migration. Migration is when the bulk of the IT portfolio is moved to the cloud. It’s also during migration that technical staff, operations, the executive team, business sponsors, security professionals, regulatory compliance staff, legal and HR must all cooperate and collaborate. Almost simultaneous with the migration, the transformation process will begin. Some of your apps will move to the cloud as virtual machines, leaving them more or less intact. In other cases, you might opt for a PaaS deployment model, in which you build a new application from the ground up to take better advantage of capabilities such as data replication, scalability and cloud services like Microsoft Azure Active Directory, which provides robust identity management. It won’t be long before you’re back for more. One thing that we learned very early in Microsoft’s own migration to the cloud is the value of a culture of continuous experimentation. In the cloud era, success requires that businesses experiment, fail fast and learn fast. The lessons learned from your failures and successes will help your company gain greater value and create disruptive innovation. 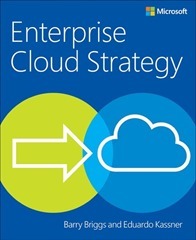 Read more on moving to the cloud and transforming your business in Enterprise Cloud Strategy, an e-book that I co-published with Barry Briggs. You’ll find a wealth of knowledge from Microsoft and some of its customers, all intended to help you succeed in your migration to the cloud. Consider it the travel guide for your journey to the cloud, without the fancy pictures.